It’s winter, and I have to admit, I’ve been hibernating. The weather so far has been spectacular, and I haven’t been spending too much time trying out new recipes in my kitchen. 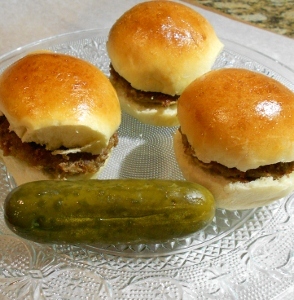 Superbowl Sunday had me thinking of making sliders (mini hamburgers), despite the fact that neither my husband nor my boys, follow sports. Mini hamburger buns are hard to find in the local Jewish bake shops so I made my own. 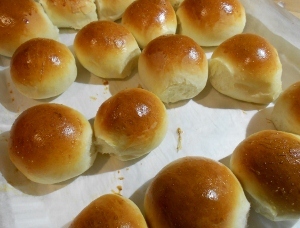 You can use this recipe to make hot dog buns as well. They came out delicious, light and fluffy – what a perfect recipe! Dissolve yeast in water with sugar. Add rest of ingredients. Knead. 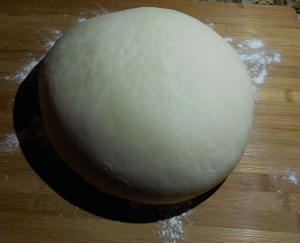 Transfer to floured surface, cover and let rise 1 hour. Punch down. For hot dog or hamburger buns, divide into 16 equal pieces. 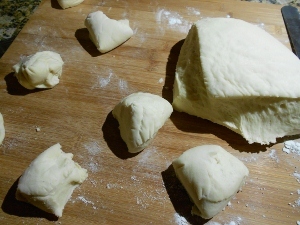 For sliders, divide dough into 32 pieces. 3. 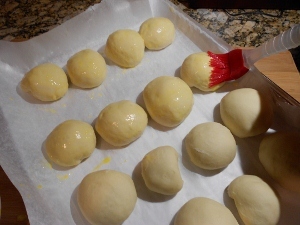 Shape into balls, place on a baking sheet lined with parchment paper. Rise 30-40 minutes more. 4. Preheat oven to 375 degrees. Smear a beaten egg on top of each bun and bake in oven for 12-15 minutes.